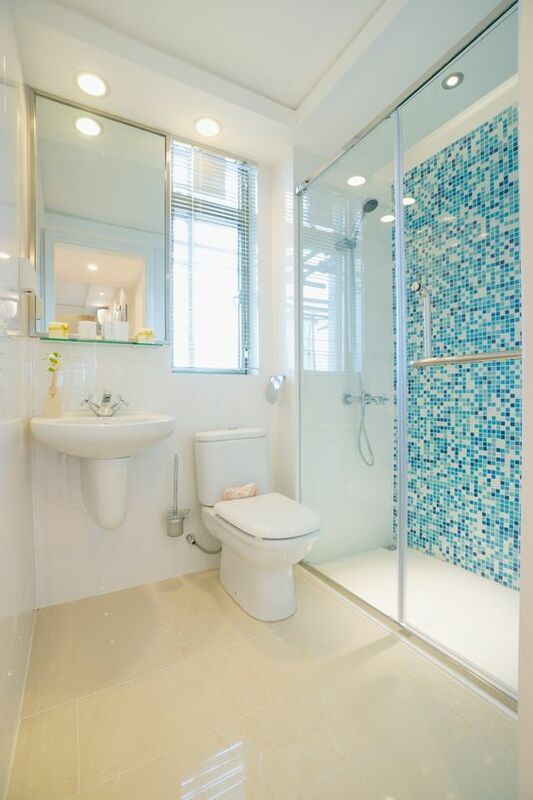 Your bathroom may be small but that doesn’t mean you have to settle for a room that looks and feels cramped. We’ll let you in on design ideas that trick the eye into thinking the bathroom’s got more square feet than it really does. Keeping everything from the tiles to the walls to the cabinets in the same light tone will open up the space and give it an airy ambiance, says Lynn Harland, of Duffy’s Designs, an interior design firm with offices in Portland, Ore., and San Diego. ‘Your eye doesn’t stop but keeps going, with nothing to break the look up,” she says. White is a classic choice, but if you want a bit more color, consider pale green or blue, which will look very modern. Harland recommends a low-luster paint like Sherwin-Williams “Cashmere,” which produces a silky finish. Paint the ceiling the same color as the walls. This will create an expansive feel, as if the room keeps going on and on with no end in sight. Want to paint like the pros? Here’s how to get started! Using a bigger tile – say, 7 x 14 inches – means fewer grout joints, and the less chopped up the room will look. “Use a grout that’s the same color as the tile so that everything blends in,” Harland says. It will make the room look like one grand space. When installing tiles, place them all the way to the ceiling, so your eye doesn’t stop above the shower door. 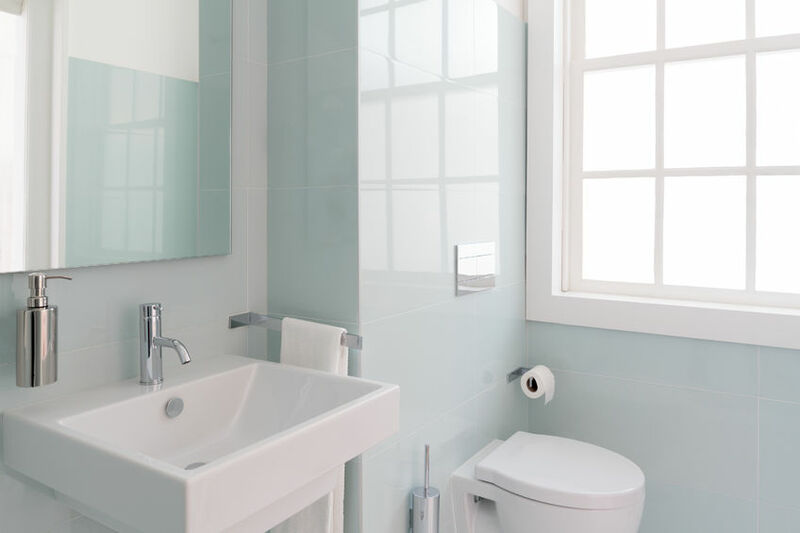 A door with clear glass will visually expand the bathroom. “You’ll be able to see right through to the inside of the shower – the tiles, the walls, everything,” Harland says. Of course, it means less privacy but “I don’t know many people who have other people in the bathroom with them when they’re taking a shower,” she says. If you don’t have a door, hang a clear shower curtain rather than an opaque one to get the same effect. Whether it’s natural or manufactured, light will make the room appear bigger. Recessed lights work well in a small area because they’re flush with the ceiling and don’t take up much space like a pendant or chandelier would. Sconces, which can be placed on either side of or directly on a mirror, are another space-saving option; bulbs should be a minimum of 60 watts. Mirrors do an exemplary job of reflecting light, so the bigger the mirror, the better. If you can place a mirror across from a window, the room will suddenly grow right before your eyes. “In a small space, you don’t want to take up a lot of wall room with towel racks,” says Harland, “so I suggest placing bath hooks on the back of the bathroom door.” Need more space for towels? Add a rack to the shower door. Even something as basic as the faucets can have an impact on the bathroom’s girth. 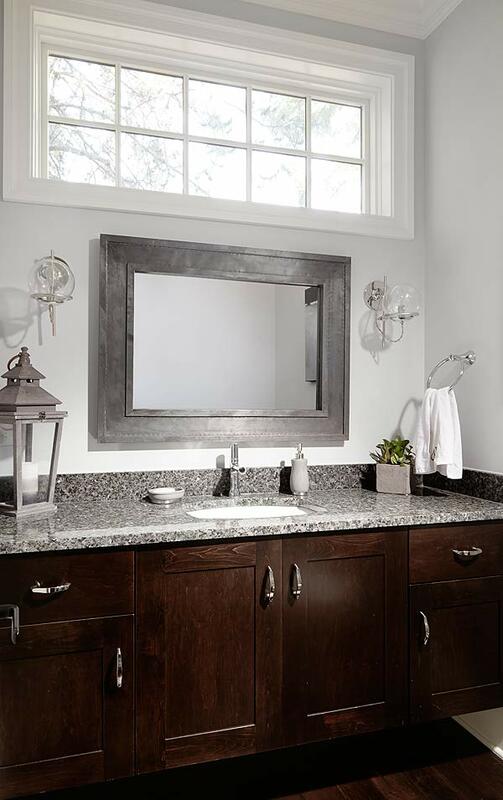 Harland likes polished chrome faucets, which reflect the light and add shine and substance. Get ready to purchase your faucets with these Tips. Nothing will make a bathroom look like it’s closing in on itself than a glut of shampoo bottles, deodorant sticks, and hairbrushes lined up on every flat surface. Corral your stuff in baskets and containers under the sink. Learn more about HomeOnTrack’s powerful features!